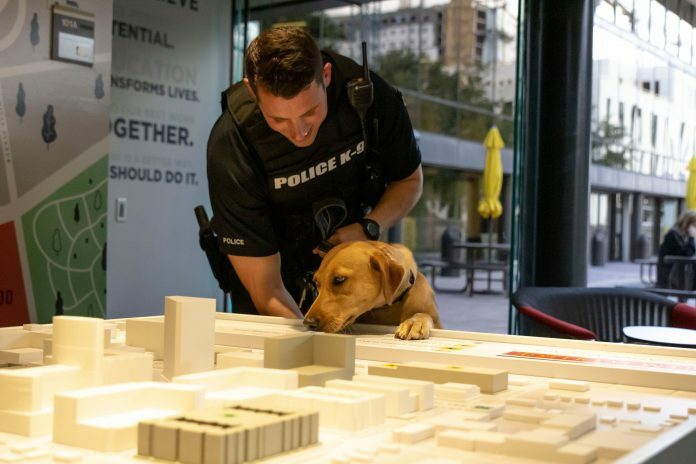 The UCF Police Department has welcomed a new officer into its ranks: a two-year-old yellow lab named Blue. Blue began sniffing out her new skills last fall, learning to overcome loud noise, navigate large crowds, and mastering explosives detection. Now she specializes in an array of skills ranging from explosives detection, to building sweeps, and assisting partner agencies with detection searches, according to the press release. The four-legged crimefighter is partnered with Ofc. Jerad Engle, a U.S Air Force veteran, 4-year UCFPD officer, and a rookie to the K9 unit. Together, the duo can be found pawtrolling UCF’s main campus through spring and will later bring their talents to the new UCF Downtown campus this summer. Blue is joining good company. According to a press release, UCFPD utilizes four other explosive detection dogs. “The dogs play a critical role in campus safety by serving as mobile force-multipliers” said UCFPD spokesperson Courtney Gilmartin. “[They] can detect potential threats and keep UCF”. Crimefighting can be ruff, but we’re rootin’ for you, Blue.